File Monitor belongs to basic IPHost Monitors. It allows to query for local or remote file size and raise alerts depending on the returned value (scaled, if necessary, to a required value). A number of problems can be detected by measuring a known file size. 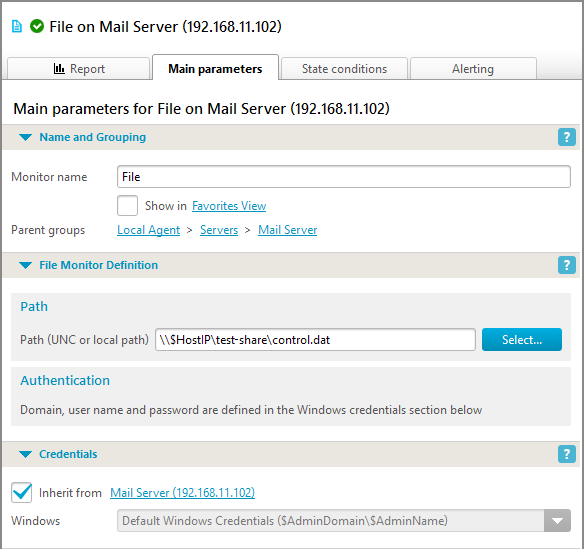 File size can be monitored manually using built-in filesystem commands; however, querying file size on remote hosts can becomea tedious work; to automate it will have to parse the output to extract the required value. 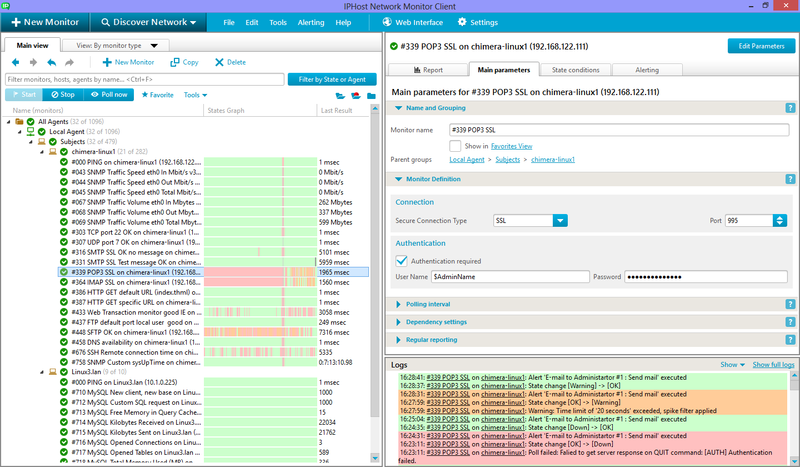 IPHost Network Monitor offers a simpleyet effective interface to query file size. It’s very easy to create a File Monitor: specify the UNC (Uniform Naming Convention, e.g. \\host\share\resource) file name and provide credentials to access the file (domain, name and password). You can also specify a value to divide the returned value by – to scale within required boundaries. Apply availability and performance parameters on State conditions tab to do the actual check. Checking mailbox size. Typical use case for a file size monitor is making sure that inbox doesn’t grow above a reasonable size. 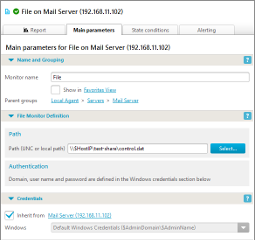 To large an inbox would mean growing server load as mail service handles big mailboxes. Also, if a mailbox is automatically processed, it could mean something is wrong with automated processing. Log file size control. In most cases a network or other service leaves a logfile; it often is rotated on daily basis, to make sure backups are made and daily activity is easier to detect. 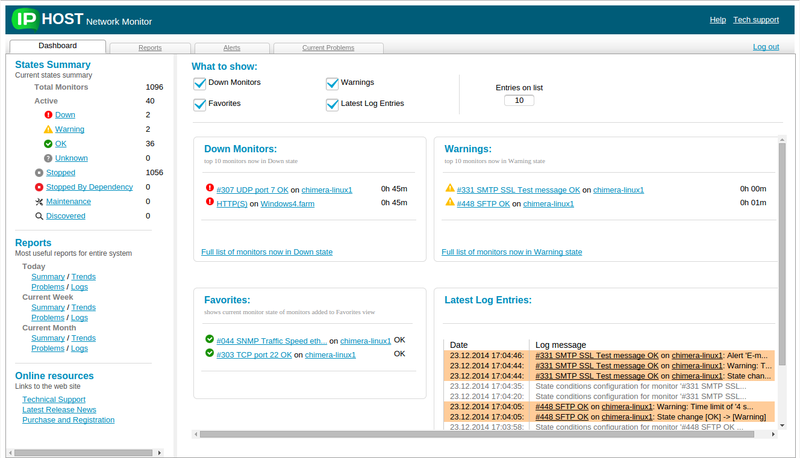 If logfile grows too large, it could mean abnormal behavior and/or too high load on a service – a situation requiring system administrator’s attention. Making sure backup copies are done. In a number of cases a regular backing up important data is being performed. A monitor can be set to watch over backup media to make sure data file size is within an expected range. If condition fails, it could mean backing up failed as well, that is an urgent situation requiring immediate handling. Watching over important files. There are situations when a file should remain unchanged. There may be a number of cases: configuration file, encrypted storage, passwords file and so on; if the file changes its size and/or datestamp, it could mean it has been tampered with – a security-related issue. General quota control. There are situations, like using DB engines, when the file used should remain within reasonable bounds. Crossing bounds could mean an abnormal situation like database not optimized in a regular way. File size monitor could itself be a conditional for more ‘heavy’ monitor type. For example, if a mailbox size grows too large, another monitor, running custom script, could be run to check other parameters. The mentioned script could be too resource-consuming to be run regularly by itself; however, it could be triggered by file size monitor. File size checks can be performed significantly quicker than SNMP and/or WMI queries crafted for the same purpose. Always consider using more robust and less resource-consuming monitor type, when there’s a choice.That applies to file size monitor as well: it is advised to use simpler monitors wherever possible, to evade querying remote filesystem. Also, proper scaling must be done in most cases, to make monitor checks simpler to understand.